My former company had a team outing to a Kid Rock concert. It was a late summer, Michigan afternoon concert being held at an outdoor venue. We naturally were planning a tailgate, so I decided to make my first drunken watermelon. Refreshing & delicious… and potent! Place a watermelon on it’s side and cut a hole in the top, wide enough to fit a funnel. Try to get the hole as deep as you can. Next, take the kabob stick, and place into the cut out of the watermelon. You need to puncture several “trails” throughout the inside of the watermelon, creating streams for the vodka to reach all parts of the watermelon. 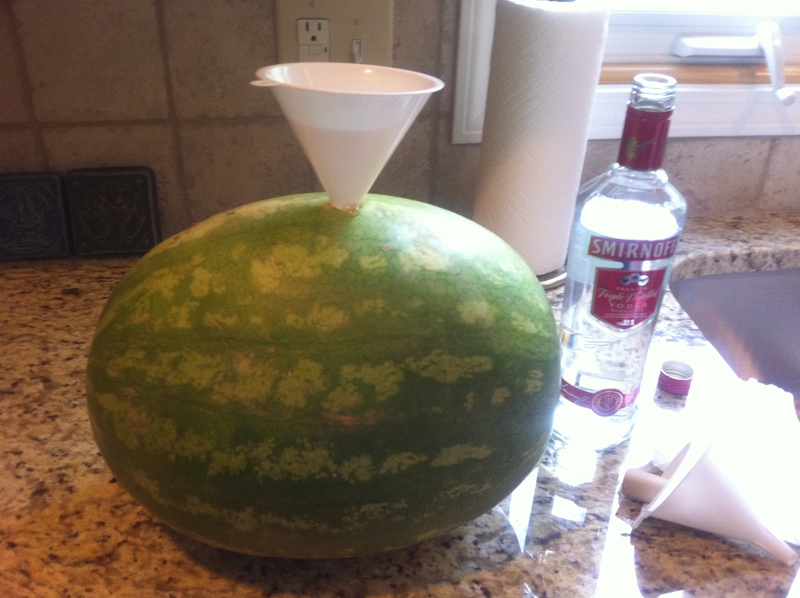 Next, place the funnel into the top of the watermelon, and pour the vodka into the funnel. It will take some time for the vodka to get absorbed. Watch the funnel over the course of several days, filling the funnel as needed. Keep it refrigerated if possible, but not necessary. Slice the watermelon when you’re ready to serve, but we sure to have it on a large platter as there will be excess juice!